[Updated with video] The police have released a CCTV photo from the recent incident at Woody’s in Sandys showing a man with what appears to be a machine gun, and said that four Pembroke men have been arrested on suspicion of possessing a firearm in relation to this incident. The firearm has not yet been recovered. The police said the suspect[s] left the Spanish Point area on Saturday [Aug 25] on a jet ski and travelled to Boaz Island where the suspect[s] left the jet ski to carry out this act. The masked suspect appeared to be attempting to discharge the weapon, however no shots were discharged. The jet ski is then believed to have returned using the same route to Spanish Point. The police have seized a jet ski believed to have been used in this incident. Officers have also arrested four men – all from Pembroke – on suspicion of possessing a firearm in relation to this incident; however no firearm has yet been recovered. The footage is being sent overseas for digital enhancement and analysis to see if it is possible determine the identity of the suspect and the weapon type. The Bermuda Police Service is continuing its investigations into the appearance of a man carrying what appears to be a firearm outside the popular Somerset bar & restaurant known as Woody’s Drive In. 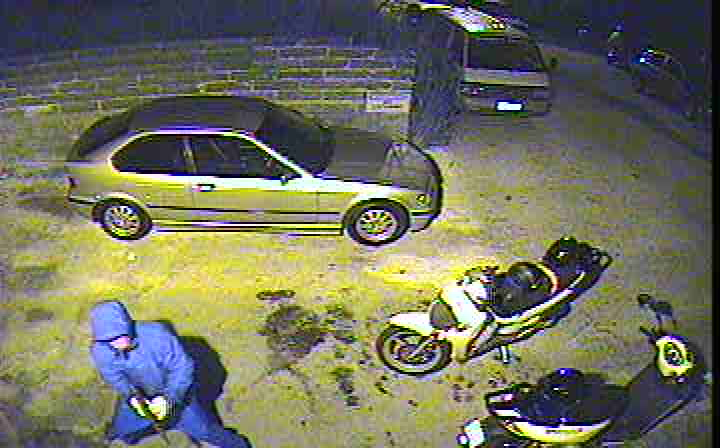 We are taking the unusual step today of releasing CCTV footage of the incident in the hope that we can identify the man. The circumstances of this matter have prompted us to undertake an intense investigation, and we need the assistance of the community. The incident is believed to have happened shortly after 10pm this last Saturday 25th August. Members of the public reported that a masked man had emerged from the side of Woody’s, and produced what they initially described as a “machine gun”. The masked man appeared to be attempting to discharge the weapon, however no shots were discharged. A full police investigation was immediately commenced, and the premises were attended by on duty police officers. The Bermuda Police Service has worked with the management of Woody’s to retrieve footage from their CCTV system to obtain images of the incident. The CCTV footage has produced the following image that I wish to share with you that shows the suspected gunman at Woody’s. 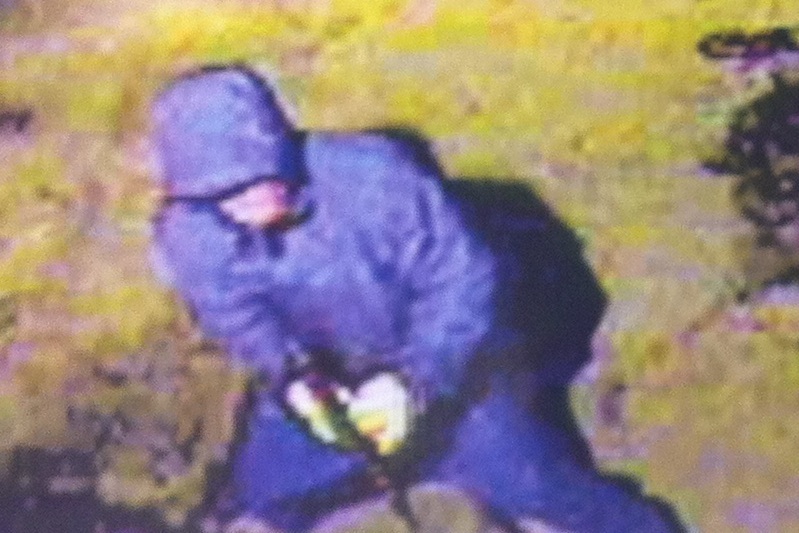 You will note that the suspect is dressed head to toe in a blue rain suit including a hood and white – possibly latex – gloves, and a red scarf covering his face. Investigations have further led us to believe that the suspect(s) left the Spanish Point area on a jet ski and travelled across the Great Sound to Gray’s Bridge, travelled through this bridge near to Boaz Island where he, or they, left the jet ski to carry out this act. The jet ski is then believed to have returned using the same route to Spanish Point. A robust intelligence led investigation led officers from the Serious Crime Unit assisted by the Forensic Support Unit to seize & examine a jet ski believed to have been used in this incident, and the results of the tests conducted are due to be received in due course. As you will note from the footage, the type of weapon cannot be clearly identified. However, the footage is being sent overseas for digital enhancement & analysis to determine the identity of the suspect and the weapon type – if possible. It is concerning because if the images and the suggestion is true that the suspect in this matter was in possession of a weapon capable of automatic fire on a crowd of innocent people, then this incident could have resulted in multiple casualties. As I have stated on many previous occasions – the lack of respect for human life is overwhelming and must stop. I am appealing to all of family, friends, and loved one out there that know something about this matter, or any other shooting or murder, to do the right thing – and help bring these perpetrators to justice. I am also asking those people in the community that are in a position to exert some influence over people engaged in these activities to intervene to prevent an escalation in tension & violence in response to this incident. The Bermuda Police Service is capable of doing many things; our arrest and conviction rate for violent crime demonstrates this, however we are dependent on the assistance of the public in these matters. To the patrons of Woody’s Bar: If you saw something, say something. To the friends or relatives of the man in this photo: If you know something, say something. Call the independent & confidential CRIME STOPPERS hotline at 800-8477. Call the Serious Crime Unit on 247-1739. Call any Police Station and speak to one of our officers 24 hours a day, 365 days a year on 295-0011. Update 5.27pm: Opposition Leader and Shadow National Security Minister Craig Cannonier has addressed this issue saying: “If the weapon being held by the young man in the picture is, as is being speculated, a sub machine gun, then it is a very serious escalation in the level of Bermuda’s gang violence. “However, I believe the Police Service has sent a copy of that picture to experts in the United States for analysis. I think it would be prudent to wait until we have confirmation of what kind of weapon, if it is a weapon at all, was being used before we sound the alarm. Update 5.31pm: Minister of National Security Wayne Perinchief today echoed the Police Service’s call for public assistance in bringing to justice those involved in the latest incident of gun violence. The Minister said: “The early cooperation of witnesses and the proprietors of the establishment is critical to the success of this investigation. With His Excellency the Governor I have been briefed today on the status of the investigation and I am confident that the Police are actively working several lines of inquiry. “The early arrests indicate as much. With the release of the CCTV image the public will have an even greater opportunity to assist the Police and I encourage anyone with information to come forward. SERIOUSLY SERIOUSLY SICK!! So many ppl would of been killed and injured by this sick guy! Please guys, put down the weapons! WOW! !THANKFULLY NO ONE WAS HURT! THANK YOU GOD FOR KEEPING US FROM HARM AND DANGER. PRAYING FOR PEACE ACROSS OUR ISLAND. Mr Andre Curtis can you please call the Gangsta Boys at Westgate again and ask them too refrain from the bang bang shoot’em up parties for two years this time??? THanks in advance. Pull this off and you got my vote! People have been convicted for less. Charge them all and put them under the jail! This incident is utterly ridiculous. COWARDS!! Ok really, I’m had enough with the tourist talk!!! What about the locals who have to live here and deal with this day to day?! Worry about us first..how about that! establishments need to install high quality cameras and place them low down. Looking down at blurry images, it is difficult to see any detail. Other than that these guys need to be taken to the banks with a concrete block tied to their ankles! I’m confused as to why these guys wish for Bermuda to become like Mexico… there’s absolutely NO logic behind their reasoning at all! well lets get a jail like Mexico…see who lines up for that . EVERYONE YOUR COMMENTS ARE DESTROYING OUR IMAGE. Kudos to you sir for seeing what really matters here. Forget the gang banger with the machine guy trying to kill a group of people, the real concern here is the comments from the secret troops. So the comments are destroying our image? Not the a..hole in the pic? Um those other places have a hole lot more going on then Bermuda and a lot more space. What little BDA has is being taken away. Is Bermuda in the USA or Caribbean,you keep it real !! There are over 313 million people in USA. There is an incredibly higher rate of this here per population. @Keepin’it Real…4Real!—-I agree, we can’t not produce news for fear of what others may think, we are merely a morsel in the large globe of people who are quite familiar with crime on a much worse scale, so even though; yes, this is Bermuda, it is what it is; lying or not revealing the truth won’t make it go away.. Being warned is forearmed….This information is vital and tourists are not naive..Has anyone read the “GLOBE” “ENQUIRER”or other gossip columns and mags..this is only new in Bermuda where we have always hidden the truth!! !Better to accept the awful truth than a despicable hurtful lie!Man up to Reality People and stop hiding from it!! Take N.-. Of and away from this case. Comments like these ruin our image. It’s not that were soft on crime or anything. Agree, not a great photo for Bermuda but every place on earth has issues similar to these so keep this in mind. What this shows is the quick response to this type situation and what we are doing to fight crime in our lovely Bermuda island. The world is changing; not just Bermuda. The economy is down is many places aroudn the world not just Bermuda, which suggests it is a global issue. The key is to find ways help through these difficult tumes i.e. for banks to lower their mortgage rates as the US have so people that are out of work can pay their mortgages. The Police are doing their job and I can see that they are doing their best. Now, let us try and do our part by helping our neighbors and working together to get through these changing times. I don’t get it either. These punks all have family- children, mother, sister, aunties, uncles. Anyone of them could have been sitting off at Woody’s and been shot. They could have shot up the place, then gone home like nothing happened only to hear there was a death in the family…THEIRS!!! Even if there is only .0001% of a functional brain cell working in that head of yours, please PLEASE use it and think about what you are doing to this country and what kind of life your kids will have if this continues. If you don’t give a rat’s behind about anybody else, at least think of your loved ones. THIS HAS TO STOP!!!! And all you mentioned benefit from their ways. EVERYBODY in Bermuda benefits!!! They buy groceries, gas, Belco, Cell bills, clothes, shoes, rent, cars, bikes, boats, jet skis, etc etc etc. Do any of these places complain that the “Drug dealers” are supporting their establishment? So shut up already with the “family & friends benefit package” already!!! The point is the whole system needs to change to take the glamour out of gang life/drug dealing! Point blank period! I think you missed my point. Quite hard to miss your point! The only “point” is that ALL of society benefits from criminal activity one way or another. 99.9% just prefer to bury their heads, turn a blind eye, or whatever else they have to do to ignore this fact while pointing a finger at those who seem to immediately gaining something from their “dirty money”! @unbelievable I beg to differ!! Please explain to me how you suggest I, a working member of society, stop benefiting from these morons!! If I knew who they were I’d turn their @$$’s in ONETIME!! The family’s benefitting from this no exactly why they’re benefitting and don’t say anything. A mother who’s child isn’t working yet comes home with money to pay rent must question where they’re getting the money from. I’d turn my son in ONETIME!! If you or your family members have a job in any business that sells goods or services you are accepting drug money everyday. Drug dealers purchase items and services. Nobody asks them where their money comes from because business is business. If they have to buy something (ie food) or pay bills (ie Belco) the business will take their money with out questioning where it came from. Therefore everybody is benefitting unless you live under a rock. I understand what you are saying. My question to you is how do you propose I stop “benefitting” from this? You said, “99.9% just prefer to bury their heads, turn a blind eye, or whatever else they have to do to ignore this fact while pointing a finger at those who seem to immediately gaining something from their “dirty money”!” My reply was if I knew who these mofo’s were I’d do something about it…I certainly wouldn’t turn a blind eye. It has to start from home. These mothers, fathers, brothers, sisters, aunties, uncles, etc. have to put their foot down and turn these suckers in. Blood or not!! Society cannot stop “benefitting” (as you put it) if those that do know what’s going on don’t step up. That’s exactly why we call it the “family & friends benefit package”, not the “society benefit package”!! My best answer to this would be simple economics of supply and demand: Kill the demand for drugs = no need for the supply. But in reality this will never happen. Think about it realistically. A person sells drugs. That means a chain of jobs is needed because of the drug dealers choice of profession. IE: Customs find drugs, Police arrest them, Prosecution/Judges deal with the case, Lawyer defends, News Reportes write story, and if convicted with jail time, Prison Officers babysit. Do you really think anybody really has a serious interest in killing the drug trade/industry anywhere in the world??? Do you see how many professions the illimination of drugs would irradicate? In my opinion as stated a few weeks ago in another thread, we need proper education for our children. Once they have the skills and mindset to be able to do something better and set/reach goals things will start to change. A hungry man will stop at nothing to eat. So if it means robbing, selling drugs or whatever to get the basics essentials of life, that is what they will do. Oh and I agree 100% with the family turning in these little a$$holes! You are absolutely right!! Education is key and we need to teach them as youngsters. Parents no longer have the upper hand over their children. Schools are no longer as strict as they used to be. What happened to morals? and values? and consequences? why aren’t they being taught anymore? When I see students these days (not all) I can’t believe how much has changed. From behaviour to uniforms. It’s such a sad situation and I hope and pray Bermuda can overcome it. @unbelieveable—-Good point!! !why should only mothers be told about accepting things from their”gangsta” children, afterall whatever people are doing to make money still circulates amongst all of us, we never know how much “dirty” money is around do we? Especially those crooks who take our money and give us nothing in return!!!!!! !And the law allows it!! Good to read 4 have been arrested and hopefully will be charged. How much for the vest ? it says on the site, just contact them. What catches my eye is the fact that they’re so affordable, but the most expensive is the stab proof vest, not so sure I’d trust that. Not that it matters anyway because if this guy was holding an AK-47, as it appears in the picture even though its hard to make out, no body armour on that site is going to stop those rounds, you’ll be lucky if it simply holds you together until you can get help. What I can’t understand is these weapons are specifically chosen by terrorist groups because of their high damage, rate of fire and reliability, they hardly ever jam. The barrel of the rifle is slighly larger than the round itself allowing it room to bounce through the barrel, also less chance of the round being lodged inside, once it leaves the barrel the round tumbles through the air rather than spinning making it quite an inacurate weapon. Its time to get serious, more fire power, more rounds downrange at once, less accuracy, more collateral damage. Think that’s scary, think about this, you don’t just fedex an AK-47 to yourself, someone let it through. But a tech-9 is smaller much like an uzi, by the way he’s holding it I can’t see it being that. Then again there’s many variations to the AK, could have been a less reliable version. Who knows, scary anyway. Someone should let him know it works better locked into your shoulder rather than hip firing like Rambo. Thank god for movies. Wow bro, way to capitalize on bad circumstances. Would you rather not have it and need it or need it and not have it? I think its a smart move. Id rather a gunman not be able to buy his armor on island. Exactly. Get two birds stoned at the same time. How many average citizens are going to buy a bullet proof vest. I am safe. I don’t hang out with or around dangerous people. I’d rather they had to buy them off island too, at least then theres a chance customs MIGHT stop it. Can you imagine one gunman decked out in full kevlar attire along with a bullet proof face mask to cover his identity? Now can you imagine 5 of them? How many innocent lives will have to be lost before people realize the cons to this? Also sorry to burst your bubble but this body armour will stop your average police hand gun, or 5.56 rifle round, but the only thing stopping a gangsters 7.62 machine gun round is the 12×10 balistics plate in the vest located over the heart, good for one round, after it shatters, all the vest is good for is stopping your internal organs from falling out. For years the US army looked for weapons of mass destruction in Iraq, you want to see one? Look in the picture above. That weapon is no joke and over the years they’ve taken more lives than Hiroshima. Sad reality is, someone knows where that gun is. Sad thing is ….that the same someone that knows who had or has it and where it is, ain’t telling either!!!! Have you seen what’s on this site? Some of this stuff is military grade, when it says law enforcement, military, government and companies only I hope that’s exactly what it means if not all you have to do is add a nice stock of medical supplies to the website and you can capitalise on both sides of the war your about to start. A balistics face mask, really? Even though its kind of an oxymoron you don’t want gang memebers getting their hands on these sorts of things or the police will be at quite a unfair disadvantage. You do realize what happens when things get out of the police’ control right? Well maybe its what we need. The british army won’t play fair with these guys trust me. Ur an @$$. You are just giving these criminals protection now. You think they won’t buy these too? Way to encourage it. It’s obvious to me that these guys can’t stand their lives and think they can wreak havoc on everyone else that is trying to enjoying theirs. Hate themselves and everyone else..here’s an idea just take your own damn lives and let us get on with enjoying our beautiful island home without you fools. Really, I don’t get this kind of violence on our shores. WHY?? This is so scary. Thank you Lord for that gun jamming. I wish it could have been the same for all the other casualties. How do we begin to fix this mess we’re in? We can’t afford to lose more people to this foolishness or any other foolishness for that matter! Parents, Guardians, Teachers, BERMUDA we need to focus on our young men and women and their well-being and take them back into our arms! Life and are loved ones are too precious to lose over WHAT?? ?…it has GOT TO STOP! Let’s also thank god for putting the guns in their hands. Of course I’m not condoning guns being here or in anybody’s hands! I’m just being real and this is unfortunately our reality. No need to be sarcastic. Surely you got the overall message! The whole thanking god for good things frustrates me, I like to point out that he also makes the bad things happen. You all have been given your instruction booklet on how to get into Heaven…God does not make things happen Good or Bad…God is Not answering Prayers right now…He Created us Now He is resting and observing…when his rest period is over…i sure hope you followed instructions. hahah, and I suppose if I’m bad santa wont bring me presents? God didn’t put the gun in his hand, God gives us choices and we either make the right one or the wrong one. God is not to blame for all the bad things that happen in this world we are so stop blaming him. It appears U don’t know GOD,for U to even think n say such a sarcastic remark like that about GOD. (Lets also thank god for putting the guns in their hands).That’s Not GODS WORKs.GOD doesn’t need their help to do anything.On the other hand satan does.SATAN BOO,EVIL SPIRITS, incase u didn’t KNOW,which U make it plain to see U DON’T.SATAN IS HERE TO STEAL, KILL N DESTROY N seek whom he may devour.Train up a child in the way he should go,and when he grows old it shall not depart from him.That princeable will never change.GOD IS LOVE N GIVES LIFE, N LOVE conquerors ALL, weather U choose to believe it or not.Unless U understand the SPIRIT REALM,U WOULD NEVER UNDERSTAND Y THESES THINGS ARE HAPPENING ON THE EARTHLY REALM.HE WHO HAS EARS TO HEAR LET THEM HEAR,N HE WHO HAS EYES TO SEE LET THEM SEE. God can do anything, he let’s satan exist. He created satan. You respect that? You look at these murderers and see victims of Satan don’t you? You don’t blame these evil people you blame satan? No wonder the island is where it is, everyone is copping out on their terrible behavior by letting a fictional character take the blame. I have to comment again, you are full blown retarded. You cant even spell, I am dumber just by reading it. I say to put all the gang members who have been going around doing silly stuff and taking lives in one area and let them take each others lives. May sound silly and childish but honestly BERMUDA is too small to have this all going on. How can one plan on having a kid when Lord only knows how it will be 10-15 years from now. do you know where your child is I ask? 4 arrests i bet no one will be getting charged. Agreed. you know they only made the arrests to shut everybody up about them being in with PSC! I and many others will believe its real when a trial begins…..
Hopefully the arrests will lead to charges. Too many bogus arrests and then we don’t hear anything else. Thank God gun jammed. One fact is 42 are near extinct (deceased or locked up), Woody’s is MOB territory so any guesses who the person on camera represents?! Hello!!!! My thoughts exactly!!! And lets see what comes of it right?! NADA. This is why I don’t go out to certain establishments. Watch how many of the same people return to Woodys this weekend. Don’t give me that um not letting these fools control my life foolishness either!! Mate, if you’re from Somerset – white, black, rich, poor, or whatever – I can bet that you or someone in your immediate family and friends love to greeze on some Woody’s. The place is an institution, my older brothers and parents and neighbours all went there and so do all my younger family. Some go in the day for a greeze, some sit off at the bar, some go in the evening. It is a neighbourhood spot where people know each other and are friendly when they don’t. Whenever I’ve been there it’s felt safe. Which is to say: Don’t blame the establishment. Blame the a-hole allegedly from a completely different area who decided to go try shooting it up. Do some of the criminal element go there? Maybe yes, but not that I’ve seen and not in any way that would make me feel threatened. Besides, everyone has a right to go to any establishment without fear of being murdered; whethere one is ‘innocent’ or not should not matter. I will continue to patronize Woody’s and hope for these young punks’ speedy arrests. Our island will not go back to normal unless we who are normal continue to behave normally while taking actions when we can to prevent such violence. That fool is not holding the weapon securely. If the weapon was set up for rapid fire, he would have lost control of it and sprayed up the place, killing several by-standards. How do I know? 80′s weapons training at BDA regiment….thank goodness that fool probably never got called up warwick camp for training. Exactly, if not he might have actually known what to do in the case of a stoppage, calling it a day and leaving wasn’t what I was taught. He’s probably still trying to figure out how to get it apart. Hopefully it was missing the firing pin completely, now you have a really cool paper weight. Dennis Brown sang ,’love & hate could never be friends ‘, he lied . I love it that the gun jammed but , I hate it because it didn’t blow up in his friggin face . Lol for real, forget the name and shame, he’d be marked for life, if he was lucky. I certainly hope weapon cleaning kits are illegal, even if they know how to clean the weapon, restricting their ability to do so could be just as much of a prevention. Its not so much of a god like feeling when you have a breach block lodged in your eye. Then again where he’s holding it he may just get a bad burn. Not that many years ago (but long enough ago that these punks were still in diapers), we used to tie up at Woody’s for fish sandwiches and a few drinks – seems to me that there are a lot more no go zones around now than back in the day and if we do not get this under control, an innocent bystander is soon likely to be a victim. God help us if that bystander is a tourist (especially an American) or someone prominent in IB. I also remember the days where you could tie up at woodys or West end sailboat club, so many places actually. heck Even Captains for Lunch ….Everyone on the same page, eating and having a few drinks, catching up with friends,no matter who you were or where you came from. I also have stopped going out period. So So SAD. And it’s only a matter of time before an innocent bystander gets hurt. Did Wayne approve this image? Well should it be said that I told you so five years ago and you just laughed as if I were stupid and did not know what I was talking about or should we say the worst is on its way if we dont do something. The guys holding the weapons is not our greatest problem,you fill in the blanks.arrest who and who replaces those that are arrested and who keeps funding this,well it aint the ones you see holding the weapons. Somebody better call Andre Curtis!!!! we need another 2 months!! No its not, Andre told me his angel bredren had his finger jammed in the barrell the whole time. Don’t worry Andre and Gabriel got this, Oh and a big congratulations to Andre and Gabriel, Gabriel got him pregnant during his conjugal visit, they’re going to be the proud fathers of the anti-christ. The irony of comments made by people who say “this is why i don’t go certain places” is this: You can be ANYWHERE and have someone next to you that’s carrying a gun!!! Unless you know who the members of gangs are and who is the one’s that carry (including the females) they can and are standing next to you in bars (even and expecially the most upscale ones)! So you will neva know where n when crap will pop off!!! That is why we, the innocent public, should know or have a picture of who is suspected of being in what gang. The innocent should have this information, to hell with the rights of the idiots! Great job BPS! While that may be true you just have to weigh the odds. They like to hang out at certain places and if you know those certain places then you should avoid them-which I do. yes it can happen anywhere but who in their right mind would contniue to frequent know trouble spots, who in their right mind will intentionally put themselves in harms way. think about it. woodys, somerset cricket club, sharon cross, rangers, crawl club, boat club has had several of these gun incidents, these are known trouble spots. like Free, i avoid these places as there are far more safer establishments where i can by a drink and for now feel safe. unbelievable, you can keep hanging out at woodys…..but i for one will not be at any establishment that is prone to violence, my life is worth far more than that. But that’s exactly why I don’t go anywhere anymore. I don’t know who may have a gun on them, I don’t know the gang members! So to avoid getting hurt just for being somewhere is me being smart. And I’m sure that why loads of people have stopped going anywhere or the “hotspots”. Seriously…am I expected to believe that no-one knows who this is….yeah right!! lol Those cowards who know who this is need to grow a pair and report it. Oh wait…I forgot, they’ll just wait until their sister, mother, father or aunt gets shot and killed – then maybe they’ll sit up and pay attention! Hmm firstly Dante go Troll somewhere else your just parroting what this dysfunctional government wants people to believe instead of accepting the main issues in this country are a direct result of their poor governance not any blog site!!! Also it looks like that “Wanna G” in the picture went out of his way and brought a brand new rain suit. I would hope that the BPS runs this picture in the paper and ZBM news in the hope that it was recently purchased and the salesperson or anyone with information may come forward. This is a major escalation in gang shootings as now it is clear they are either targeting multiple persons (groups) or are willing to risk high collateral damage in their quest to take someone out. This is a very disturbing situation and I dread waiting for the fallout from it. Maybe the gangs are just trolling bro. Wouldnt that be poetic. Agreed. Why won’t they release the actual video and not pictures. No s#$t especially on the rain coat situation. Cause these guys wouldn’t be caught dead in anything that ain’t name brand on a regular day! So finding out who bought this just to make a mid-night run should be real easy! Stop acting as if Bermuda is immune to these type of things, this is happening all around the world everyday. Bar patrons getting attacked by a man with a machine gun..? Er, no. Things like this do not happen “all around the world every day”. There are plenty of places where things like this never happen. point taken gman- but why on an island of 21 square miles can the police not eradicate the violence? theres only so many places these guys can hang out and where the guns can be stashed. its not like in NY or CA where they can drive upstate or to Nevada, respectively. its the smaller picture that needs to be focused on in Bermuda’s case, not the larger picture, blaming everything on the way the world is going. Yes it is but not with machine guns and do not forget that the rest of the world is far bigger then Bermuda. Sounds like we need one, but look at blackwater, or academy as its called now, they had military privilages but answered to nobody. Human nature will always take a mile when given an inch, the attrocities this PMC commited can be seen on youtube. They are nothing but mercinaries. We need people that truly care about this island and its people. The B.O.P.E. In Brazil is comprised of the most elite of soldiers and said to be the only organization free of corruption, this is what we need, vigilanties with a badge, gun and a job to do, and not because they’re told to do it, because they want to…let me know when recruitment starts. I been talking about B.O.P.E. for so long but nobody listens! Finally someone who thinks alike. Ah the Barret 50.cal, the Hummer of firearms, that’s how you reach out and touch somebody. Now that’s what I would call an investment in infrastructure. No such thing as ‘taking cover’ and no such thing as WIA (wounded in action). A vest though? I’d take a guillie suit, you can’t hit what you can’t see. Well I’d gladly take to the streets with a GPMG to clear out the straglers with you as the eyes in the sky…sounds like the making of a Bermudian B.O.P.E… Even I knew it was only a matter of time before we saw weapons like these, deperate times call for desperate measures. hmmm like minded brethren I have mulled this scenario over a few times just don’t have the temperament or resources to engage in such actions. The 50cal is a bit of over kill but could you imagine the impact on gang life when they sit around chillin in their safe havens and hear the impact of the round that takes out the H#IC and covers them in his matter. Let that happen a few times knocking off one member after another, the streets would be clear of them and gang life would no longer be viewed as a viable option. & the gun jammed!! you little FOOL!!! Okay, since you are the expert tell me where this doesnt happen, cause if Bermuda isn’t another world as we call it, then what is it? In my opinion, some of us young people love to see Bermuda suffer. Bermuda is too small for this craziness. Us, young people see fights almost every single day in schools and we are highly influenced. We need to save this island. Our generation is slacking off but the some of us want to move away, although its much worse. But we are thinking we can get injured or killed faster here then outside Bermuda and we along with everyone else too is tired of our families in body bags. This is almost a daily process. To the point where we aren’t even surprised.So yeah, four people arrested. nine times out of ten. They’re gonna be sent right back out to do the same stupidness until they finally come to their senses or their killed. This is how it is Bermuda. We need to change. Funny…I never hear of incidents of this nature happening at more upscale establishments. If you know where the gangbangers and their friends hang out perhaps it’s better that you stay at home or go to upscale establishments if you want to socialize and have a night out on the town. i wouldn’t send my dog there either…and its too bad because during the season they have the best lobsters on the island imo. Hey, if getting the best lobster of the season in Bermuda means going to Woody’s then I’ll have to pass and take a chance at the complete opposite side of the island in St. David’s. If getting a lobster can cost me my life, I’d rather have a tuna fish sandwich. Woody’s will never see me except when I am speeding past on my way to dockyard to hook up. Surprise! Red Lobster they live in St.Davids and St.GEO.Incase u didn’t know ,their in every pasrish boo. all of front street gets ruled by some of these gang members. many other establishments get frequented by these gang members. it is not just woodys or rangers etc. the many fights and stabbings that happen island wide and people still open their mouth to say certain places. yes i agree that some estalblishments have a worst name than others however its certain places that when something does happen it does not go public at all. after shootings at the movie theatre, devonshire etc. we should all come to the conclusion that horrible and horrific things can happen anywhere. The low lifes do not care anymore. if a person can catch a jetski to go kill i dont think he would hesitate to do it a upscale place. Just Saying fact is Upscale or Lowscale Violence is taking over our island. @Young Person who Goes everywhere..My dear, to some degree you have a point, but I was not referring to Front Street at all. I DO NOT SEE Gang activity or violence at Harrys, SeaBreeze at Cafe Lido, or Tuckers Point. That is what I meant by upscale (by Bermuda’s standards). Just because you don’t see the “violent” side of it doesn’t mean that “they” are not there. Trust n believe “they” are most definately at ALL of these places!!! @Unbelievable..Oh Please..give it a rest.. I am LMAO at your silly comment. So please enlighten me on your sightings at these establishments..
@Unbelievable…on another note..if ‘they’ implies BLACK Bermudians, then there are quite a few middle to upperclass BLACK Bermudians who dine at these establishments who are NOT affliated with gangs..
Well I’ll put it to you like this. If you are looking for white tees, snap backs, and gold chains you have a lot to learn. There are many educated and established working class PSC, MOB, 42, and other’s out there that that are in very interesting positions…. As a matter of fact, I’m looking at a few facebook photos now with some of the playas “Big in the Game” at two of the above named establishments and a few others in their suit and ties. Once you stop labeling people and expect certain “stereotypes” then maybe you will get ya head out of your “arse” and stop thinkin that’s where everybody elses is!!! unbelievable unbelievable…lol..i hope you are going to the police with all of your information. i will take harry’s over woody’s anyday..
PS: And if you think that all gang members are “black” you are even more stupid than I initially gave you credit for!!!! @ Unbelievable..I suspect that there are many ‘educated’ gang members and their affiliates. I had to laugh when you mentioned “working class”, which the dictionary term means that they have lower tier jobs (as measured by skill, education and lower incomes). But then again, it’s what you perceive to be “established working class”…LMAO. And perhaps they have had photos taken at some of these establishments, but it is more than likely because they have been invited as guests and these venues would not be their weekly hangouts. Not once did I mention their attire…and as we both know, any thug can wear a suit and tie. As you appear to know who these persons are, why don’t you help the community in contacting CRIMESTOPPERS and report their activities…unless of course you are a “BIG PLAYA” in gang activity as well!! Nah not any affiliation with anyone at all. Just happen to work at various venues of all types and see/hear alot. Sorry, not worth putting me and my families lives at risk for something the Police already know and allow to occur. I’m sure you can pick the bones out of that one. If not I’m sure you can Google the definition of “being paid off” to look the other way which is what most of the ones in positions to stop this are! And before you ignorantly ask, no I am not one of those. I don’t hold keys or handcuffs or chauffeur/bodyguard anybody! Now this convo is over because obviously you are trying so desperately to find out who and what I know. Sorry that don’t work with me. Have a pleasant weekend in the safety of your “more upscale establishments”! A: Woodys needs to stop catering to MOB. They might be cool there but they are attracting the violence. Freddy? Nuff said. B:I was there visiting and tried to get some other tourists/visitors to come and they were told to stay away from that place. When I went it was nothing but MOB and freaking rap music being played for 10 seconds a song by some retard wanna be DJ. Bring back the Bob Marley music to calm them down and or drive them away. C: The police should know that this is a known hang out for MOB so why don’t they keep a few patrol cars in the area in the area on the weekends? Maybe around Boaz Island and somewhere on the bridge. PREVENTION! You Keystone cops are daft! After the fact is too late. Unfortunately, MOB is the least of our worries, and that’s sad to say. We should really be looking at parkside and who they are connected to. Any convictions from parkside? I’m not sure, but I am sure there’s a bunch in witness protection, and a bunch of convictions from other sides. One thing I’ve noticed, most other gangs have some sort of code or morality, as hard as that is to believe, parkside is ruthless to say the least. I dont support any gang but if parkside is allowed to gain a strong foothold, we are in serious trouble. FYI they’re famous for extortion. Come Correct you have said it all right here! What are the Police, politicians and people of Bermuda going to do??!!! Allow a group of boys to run this island. This country is worst than Jamaica now. Now that’s scary! Yankee boy was the father to this crew, and sorry to say he was many things, but at least he wasnt as ruthless as the young bloods that have taken over, we all know he had guns but did you ever hear of him using one? He may have showed it to you to say you don’t want any parts, but these guys these days want to shoot you because they feel you owe them a % of your paycheck. This island has changed for the worst and its because it was allowed to. @crab! I’ll stfu after your mother gives me my —–. She da best! Ill repeat myself for the 100th time after the several first shootings when the man got shot after intruders bursted in his house when he and his friends were playing poker and shot him, THE GOVERNMENT should have set up a special task force to eradicate these guys and make serious arrests, even if it means going house to house pulling these guys out of their moms houses starting from St.georges and work your way up to Dockyard. Being that this is a small island we could have things back to normal very soon. What has anyone really done so far? People blogged that it would infringe on liberties and so on,?? These guys loose all their liberties once the shootings started. Had that machine gun have worked that guy caould have killed ten people that night if he wanted. This is not the 80′s and 90′s anymore the mindset now is a lot more coldblodded, these are not guys who just want to steal your bike for some weekend fun anymore. If these guys are being a terror to the community at large think what their households have to go through, a lot of these guys threaten and keep their family in a hostage situation there a lot of women going through some crazy stuff. And a lot of people do that is why we are so damn angry Wayne. When is enough going to be enough? @ SIGH – I totally agree with you. If we really analyze the situation here, many things just don’t had up, which leaves room for speculation, concern, and worry. The police have the right to take the proper proceedings when these shootings happen. But what is it they do? Nothing, they come on the media and act dense. If they really wanted to know whose shooting who. They know who sits out on court street selling drugs right under their noses, go get some warrants and go to the houses of all those individuals involved. Then there will be some real evidence coming up. Until then, this ignorance that is taking place will continue, because the authority of the land have the power to seise it all, but choose to do otherwise. Which causes the innocent to suffer for the guilty. When the goverment stops spending money on unessary things such as, public buses that break down every few weeks, politians enormous payouts and focus on these issues than we could help better our young people. I never see our Premier Paula Cox talk much about these incidents and her correction action plan for the PLP she only may comment when there is a death maybe.Call me maybe. What about the Gas station CCTV didn’t this guy allegedly take off from there? It’s a real shame this government doesn’t have any money, this whole island or at least the certain ‘gang’ parish’s should be rigged with high definition cctv…. I’m sure that would help arrest a lot more of the morons. Someone should have ran his stupid behind over when the gun jammed! I really do not get it either. Why are they so hell bent on ruining this island that they have to live in? Bermuda is small already – why involve yourself in gang warfare and have to watch your back everywhere you go and only be “allowed” to go to certain places? Who wants to live like that? Is it really worth it? When is BPS going to get serious about this problem? This is not just bad for tourists but more importantly locals. This is exactly why I do not go to certain spots because of things like this. We need more search warrants executed, we need more previous convicts randomly checked up on, more sting operations, do something! We are only so big, we know who is involved. Be proactive! Make these bars and clubs where large numbers of people attend have up to date cameras/security. Also you mothers, girlfriends, friends and relatives of these little hoodlums need to stop enabling. What goes around comes around, if you have knowledge of, or helping these little boys carry out these criminal acts don’t be surprised when it comes back to you. He shoots someone down, then don’t be surprised if he gets shot down too! Don’t cry in the newspaper and say you had no clue he was in a gang. BPS and the courts need to get tougher on this – enough is enough. When you check it out..the regiment trains ppl how to use guns “rifles”…..some ppl end up liking it so much they want to own one…..they can teach you how to be responsible with guns, but ppl are going to do what they want to do….you cant really tell how securely he’s holding it by a still shot if he’s still in motion but it looks like he about to take stance for the recoil. What the f**k did I just read? I’m just gonna go ahead and assume you never got higher than a C in any of your classes in high school, am I right? He is saying that the police are locking up all the gangs accept the Parkside crew. Everyone knows which crew is doing the killing. They are just making their world smaller and smaller.. What inspires so much anger and rage that you would ride a jet ski from hamilton to Dockyard at night wearing a raincoat, carrying a semi automatic weapon,, Park the jet ski and go to an establishment to attempt to kill individuals randomly.. Like really,, what inspires that???? Thank you Lord….for allowing that gun to jam, and Thank you Bermuda Police Service! If ya sayin thank you to Bermuda police service ya sayin thank u to— parkside. Str8. just home from work and all l can think is what is this going to do for tourism there Mister Minister? Also fueled by a cocktail of drugs and alcohol. To clean up these so called Gangstas,a private soldier of fortune firm such as “Black Water” should be hired and clean up the island covertly. They have no ties to the island so no friends and family will be around to disuade them from their job. They might also zip tie innocent peoples hands and kick them into the water like they did not so long ago in a middle eastern country. There’s a problem when you have no one to answer to and your bosses are just as corrupt as you…sound familiar? Let me go out on a limb here and suggest that the BPS know who most of the gangs members are across the Island. It is time to declare limited martial law targeting these fools. Round them up and detain them for as long as we can under our constitution. They are a clear and present threat to themselves, our community and the reputation of our island. So many people on here saying so much negative things!!! I’m so greatful that no one got hurt!!! This is still devastating for the people who were there!!! Please show some compassion for the victims!!! Are we still calling them Machine Guns last time I checked, this is not the 1950′s. I think its called an Automatic Assault Rifle. It doesn’t look like they know how to handle it. Assault rifles are categorized in between light machine guns, which are intended more for sustained automatic fire in a light support role, and submachine guns, which fire a pistol cartridge rather than a rifle cartridge. So we call them Automatic Assault Rifles. Dis one aint an automatic. Only semi-auto. Its rare nowdays to find an ak/carbine dats full auto. stopped in de 80′s. I could change that with a simple household tool, I’m sure if I can someone else can too. Hope all those innocent people aren’t scarred for life. What we should have is a program linked up with one of the most dangerous maximum security prisons in the US and send each convicted gang member there to serve their time. They would be crying for their mama before the plane even takes off. im am sure that the girlfriends/boyfriends (yes i said dat)..of these stupid boys know wat was done yet won’t say nothing except say that this crap needs to stop.. well break the silence! The PLP & OBA can’t fix this, so all you poeple keep praying and keep listening to who ever is in charge after the election. Welcome to the NEW BERMUDA!!!!!!! We just like the USA and the Caribean now. Now give me a license to carry a fire arm like the rest of the Countries! A nice Beretta 90Two . 40 S&W with light laser. would be good in this jungle. Real talk. Get rid of psc and bda will be bk to normal. Bermuda goverment should look into something like this. if we can spend 13 mill on tourisim to have them scared Sxxxtless by guys fighting on a bus, then im sure this is a plausible investment. http://www.shotspotter.com/technology/wide-area-acoustic-surveillance the range is 20 square miles. I believe that God stopped that gun from killing anyone in that place. They should all thank God! I would have thought that since PLP Headquarters is on Court Street our upstanding transparent Government would at least want the immediate area cleaned up. I wonder whats taking so long? If this so called gun (if it was real) jammed it probably was buried somewhere. If you don’t keep a gun clean it will not work as good. Soil gets in or even the saltwater element (rust) corrosion. I would take a metal detector to the Spanish Point area or some of the arrested yards and do a check. I would also start to trail these guys and watch where they are going and what they are doing doing. You may find out where they are burying the guns. Also, I hope they didn;t just arrest the same “guys” (like P and J); you really think thse guys are doing this themselves???? Of course not, they have soldiers that are waiting to make an impression. Keep following and watch who is associating with these guys and start following and busy every last ones house. Some are so young they will crack. Honestly… As a citizen of Bermuda I can’t say that I feel comfortable with the police that are in authority in the land of Bermuda. This is their personal playground with these gangs. I can’t fathom how Detective Chief Inspector Nicholas Pedro could stand there and say that he is unsure or can’t say for sure that it is this ‘parkside gang’ that is committing these senseless acts of violence. Majority of the people in this country know that parkside have been committing most of the deaths by guns in this country. It is safe to say that they want to full control of the streets in all parts of Bermuda. Therefore, they take their dominant demeanours and use their guns to control the island. Behind every street male there is a bigger person above that they answer too. Clearly this is organised crime here in Bermuda. Time to expose them all before it’s too late. I mean, face it people, no on wants to believe that the authority of the land might have something to do with all the gun murders in this country. Mainly because the POLICES job it to serve and protect the citizens of the land. Open up your eyes. There is something bigger going on in this country. Something that the average eyes can’t see. It is something bigger going on. This is not just a Bermuda thing, this is a world wide epidemic. In most cases the powers that be are orchestrating certain events to create fear and control the mass. Election is coming up and this could be a scare tactic by the ruling party. Also they are known use P R C tactics. Create a Problem, Get a reaction from the majority of the population to clamp down. So the ruling party finds a solution. In the mean time their rights are being stripped away and the constitution ignored. Soon the regiments going to be patrolling. I saw this coming about a decade ago. I also believe that plp is being used to destroy the island. I’s just too obvious. Its been one Scandal after another with them. IB and Tourism are just political footballs to temper with the psyche of the population. The reason why I say this is because all Western countries have been on a plan since the 70′s called Agenda 21 which involves De-industrializing all the countries that had major industries. Bermuda is not immune from this. The only way to fix this is to empower our minds and be self sufficient , not relying on Government. Stop giving Government so much power. Also it doesn’t matter if it is plp ubp or oba. They are all controlled by the same entity. They just have different masks and slogans. Its all a game and you have been fooled all these years. The Government has no choice but to burrow money from major off shore corporations, while the economic hit men (Consultants) come in to make more deals and give more toxic advice. The Interests is the only thing that gets payed off by the taxpayers. The Principle keeps rolling. As this continues, the island will be sold piece by piece to Lendees as the debt spirals out of control. correction = sold piece by piece to the Lenders as the debt continues to spiral out of control. If these dudes are practicinfg firing these weapons at all, it is probably out in the open waters far off shore so that the sounds of gunfire can’t be heard.